I received my PhD from the Department of Criminology at the University of Ottawa and my MA in Legal Studies from Carleton University. Before joining Laurier, I held a SSHRC funded postdoctoral fellowship with the Canadian Observatory on Homelessness, York University. I am a critical criminologist, using a social constructionist framework to study marginalization and exclusion. 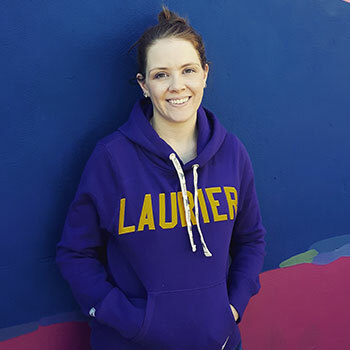 I am a qualitative researcher with a primary focus on homelessness, as well as mental health, autonomy among marginalized people, and homelessness prevention. Dej, Erin & John Ecker. (2018). “Homelessness & precarious housing in Canada: Where we have been and where we are going.” Public Sector Digest. Schwan, Kaitlin, Steven Gaetz, David French, Melanie Redman, Jesse Thistle & Erin Dej. (2018). What Would it Take? Youth Across Canada Speak Out on Youth Homelessness Prevention. Toronto: Canadian Observatory on Homelessness Press. Gaetz, Stephen, Erin Dej, Jesse Donaldson & Nadia Ali. (2017). Leading the Way: Reimagining Federal Leadership on Preventing Homelessness. Toronto: Canadian Observatory on Homelessness Press. Gaetz, Stephen & Erin Dej. (2017). A New Direction: A Framework for Homelessness Prevention. Toronto: Canadian Observatory on Homelessness Press. Gaetz, Stephen, Erin Dej, Tim Richter & Melanie Redman. (2016). State of Homelessness in Canada 2016. Toronto: Canadian Observatory on Homelessness Press. Dej, Erin. (2016).”How do we make sense of mental illness?” In George Pavlich and Myra Hird (Eds.) Questioning Sociology: Canadian Perspectives, 3rd Edition, pp. 38-47. Don Mills: Oxford University Press. Dej, Erin. (2016). “Psychocentrism and homelessness: The pathologization/responsibilization paradox.” Studies in Social Justice 10(1): 117-135. Dej, Erin. (2015). “Sanctionner les (non-) coupables. Préciser la disposition de non-responsabilité criminelle.” Criminologie 48(1): 37-58. Kilty, Jennifer & Erin Dej. (2012). “Anchoring amongst the waves: Discursive constructions of motherhood and addiction.” Qualitative Sociology Review 8(3): 6-23. Dej, Erin & Jennifer Kilty. (2012) “Criminalization creep: A brief discussion of HIV/AIDS non-disclosure in Canada.” Canadian Journal of Law and Society 27(1): 55-66. Dej, Erin (2012). “What does mental illness mean?” In George Pavlich and Myra Hird (Eds.) Questioning Sociology: Canadian Perspectives, 2nd Edition, pp. 79-89. Don Mills: Oxford University Press. Dej, Erin (2011). “What once was sick is now bad: The shift from victim to deviant identity for those diagnosed with Fetal Alcohol Spectrum Disorder.” Canadian Journal of Sociology 36(2), 137-160.